This is an original strategy game, written in VB2008 (for wider platform compatibility). 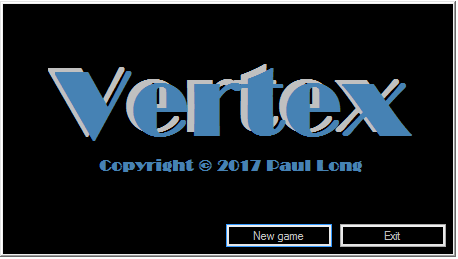 The aim of the game is to beat your opponent (your computer) in a race to claim the top vertex, through a progression of legal moves. Click the above How to play header or this animated gif (in a different window) to see a demo. Each player is randomly allocated 1-4 chips each time it's their turn. Every one of your 1-4 chips will be red and your opponents will be yellow. Along the way to the top vertex, there are two randomly positioned power vertexes which will give you (for one power) a 1 in 8 chance for each chip allocated to you will be a 'wild' chip. For two powers, you'll have a 1 in 5 chance of your chips being a 'wild' chip. 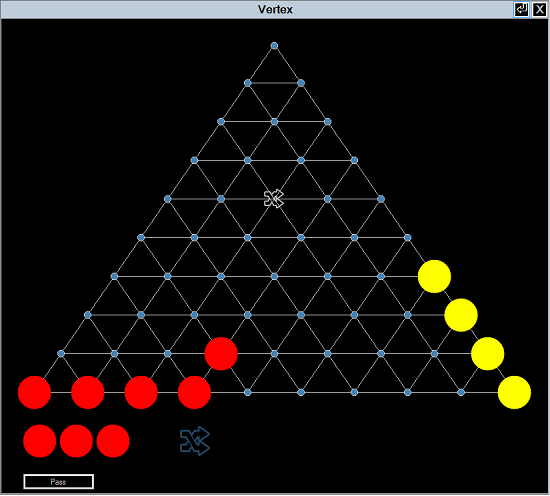 Can be played either as a free turn on the bottom left vertex at the start of a new game, or in any other case, only beside or above another Red or a RedWild chip, progressing chip by chip towards the top vertex. Can be played either as a Red chip, but also may be played beside or above any other chip, for blocking your opponents progress. This is your opponents chip and follows the same rules as a Red chip with the bottom right vertex being the free move. This is your opponents 'wild' chip and follows the same rules as a RedWild chip. isValidMove, and the Public Function play. These are used both internally within the Game Class, and they're also called from the main form (frmGame). It also contains six Private methods which are exclusively used within the Game Class where they contribute to the opponent's (computer's) gameplay algorithm. isValid = isValid Or v(y)(x - 1).chipType <> ""
isValid = isValid Or v(y)(x + 1).chipType <> ""
isValid = isValid Or v(y + 1)(x).chipType <> "" Or v(y + 1)(x + 1).chipType <> ""
VB.Net is a much underrated programming language these days, which is a shame as it is equally as versatile as C#. I've updated the zip file. New version has the reduced screen size, to be usable in laptops with smaller screens, and minor changes to the gameplay algorithm.